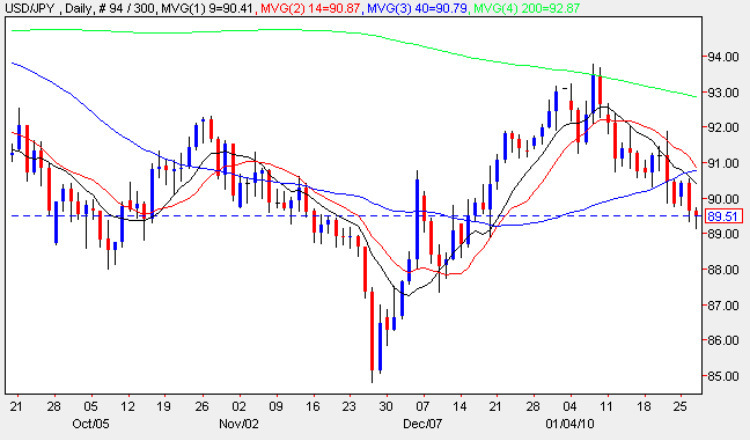 Following the tweezer top reversal candle pattern of earlier in the month, the dollar yen chart pair has continued to slide lower, once again moving below all three of our short term moving averages (9,14 & 40 day) as well as the 200 day, and edging dangerously back towards the price level at which an intervention from the Bank of Japan will become almost inevitable once again. With this level now firmly established at USD85.00, any potential move backwards towards this price point will see the BOJ step in to ensure that any further strength in the Japanese yen is snuffed out very quickly. However, it is interesting to note that any intervention to date has been short lived, with the move higher petering out within a few weeks, indicating once again that whilst no central bank can fight the market on its own, the BOJ’s willingness to allow the Yen to weaken had more to do with the fact that the Nikkei has been falling thereby encouraging foreign investment. However, with the technical picture looking bearish as the 9 day moving average moves below the 40 day average, expect further moves lower in the short term (especially if the Nikkei continues to decline), with the prospect of a sudden and sharp move higher as we move into the high 80’s price points and lower. All the fundamental news for Japan has centred on the BOJ meeting at which rates were kept on hold and the only change was the Bank’s comments that higher oil prices would have an effect on Japan’s deflation problems. Meanwhile markets are waiting for the FOMC statement this afternoon as well as Obama’s State of the Union Address & Geithner’s appearance before Congress to explain the AIG bailout.